White attending the opening day of the LA Gift Show yesterday and I truly found a treasure at the LA Mart. I had the pleasure of meeting Gina Donald and Leslie Johnson the founders and designers of LG Designs. 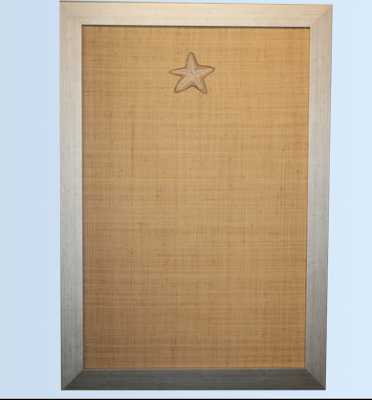 LG Designs is a company which makes and sells custom made-to-order monogrammed posting boards. The friends came up with the idea when they could not find an elegant, stylish and functional bulletin board on the market. 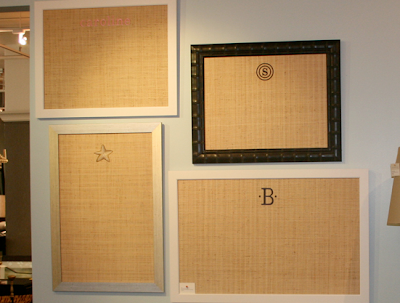 The monogrammed raffia is so chic and different, who knew that a bulletin board could be a show-stopper itself? They are perfect to use in your kitchen, hallway, playroom, office, or childrens room. Standard sizes are 20 x 24, 35 x 25, and 40 x 28 but they can also make custom sizes upon request. 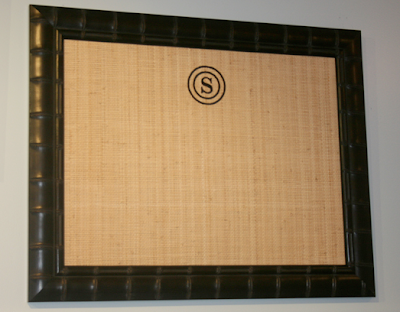 Frame choices are white, black, gold, silver, and white, black & brown bamboo. If you live in Los Angeles, you can order them from Waterleaf in Manhattan Beach, otherwise an order form is available on the LG Design website. I can't wait to order one for my son's room and for my office. The hard part will be picking the design...single initial or name? !